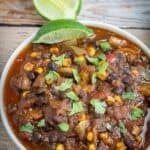 Savory black beans mixed with sliced peppers, corn, crushed tomatoes, and southwestern spices are slow cooked to perfection in this Slow Cooker Black Bean Chili. This is the perfect meal to use up what you already have in your pantry. You won’t believe how easy it is to make! 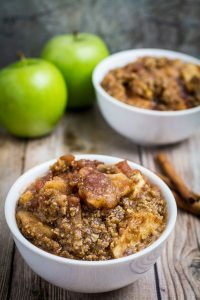 It may be warming up in some places, but it’s still slow cooker season! 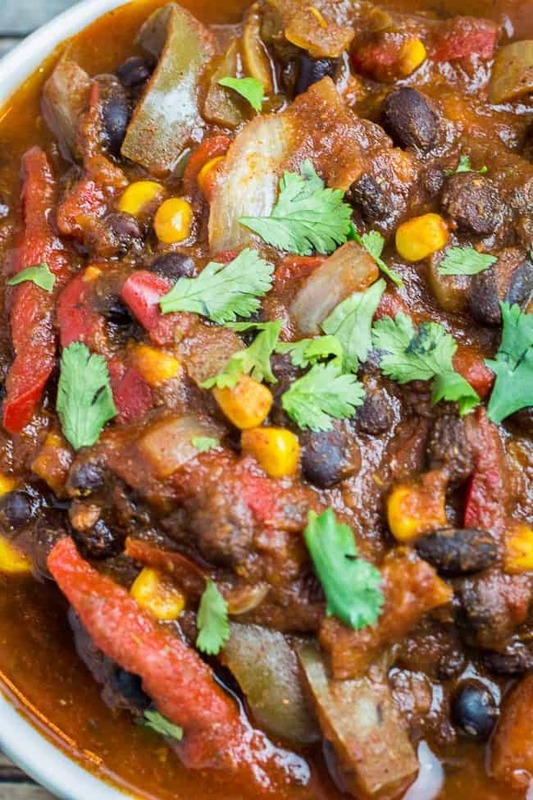 And it doesn’t get much better than this Slow Cooker Black Bean Chili. It’s so simple to make (can you pour some cans of beans into a slow cooker? Good, you’re hired! ), and SERIOUSLY delicious. No, I mean it. I’ve probably had like thirty bowls of this just this week. 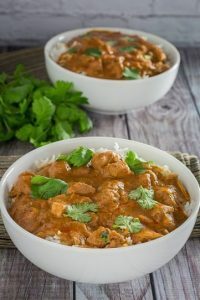 Did I mention slow cookers are a great way to make meals ahead for the whole week? Hello blogging world! I know I’ve been pretty quiet this past month. Sorry! 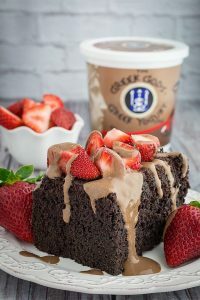 But now I’m back, with new and improved gluten free recipes! Hooray! 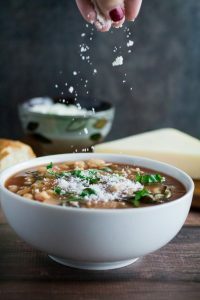 I love this Slow Cooker Black Bean Chili so-so-so much for a few reasons. First, I ♡ southwestern food (and I know you do, too!). Second, it’s EASY. 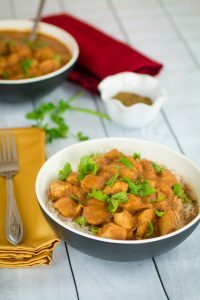 Third, it’s the perfect mix of savory flavors, wholesome veggies, and fresh cilantro. What more do you really need in life? 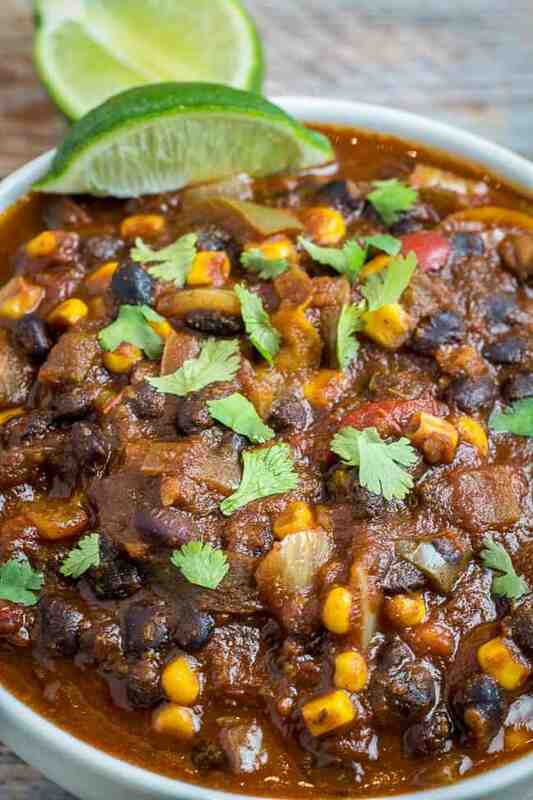 Oh yea, this slow cooker black bean chili is also vegetarian. Just in case. You can feel free to mix up the ingredients and add whatever veggies you need to use up in your refrigerator. I’ve had a lot going on. Some of it good, some of it not so good. But in the end, it’s all turning out to be OK. Life is full of ups and downs, right? C’est la vie. To begin my crazy whirlwind of a month, I went to the doctor for a routine physical. This turned into a series of tests (with stitches), which ended with a minor surgery (with more stitches) on my shoulder and back. After four weeks, I finally received the last report saying that everything is officially OK. Phew! Moral of the story? It’s really important to get your yearly check up with your dermatologist. Seriously. Prevention is the best medicine. I’ll be going twice a year from now on. Two days after my minor surgery, I moved across the country for a new job. That’s right! Goodbye NYC, helloooooo sunny-beautiful-tropical Florida! My winter coat is now in storage and I am LOVING the weather so far. We decided to drive all the way down (about 17 hours) with the car full of suit cases, our two cats, Andrew, myself, and my sister. We strapped a case to the roof of the car, and then it proceeded to rain the entire time. Which saturated the straps holding the case on to the car, causing it to rain inside the car. A few quick towels around the straps quickly fixed the car-rain, but around Virginia they needed to be changed. We stopped at a Target and bought some new towels, changed everything out, checked on the cats, and all buckled into the car to leave. That’s when the tornado sirens started going off. We put the cats in a shopping cart and headed into the PetSmart next to Target. We waited the storm out for the next 3 hours, watching outside for signs of hail or wind patterns. It turned out there was a tornado about 15 minutes away from us, and a few more in the next area we were about to drive through. It was a little bit scary. After the warning was over, we headed out again. About an hour into driving, the wind was blowing the car pretty hard that we just stopped for the night. The next day was MUCH better. The sun was shining, and we made it all the way to our new place. Hooray! And that is the crazy whirlwind that had been my life for the past month. Right now we’re just looking forward to slowing down, unpacking, and getting back to normal. Which means new recipes! 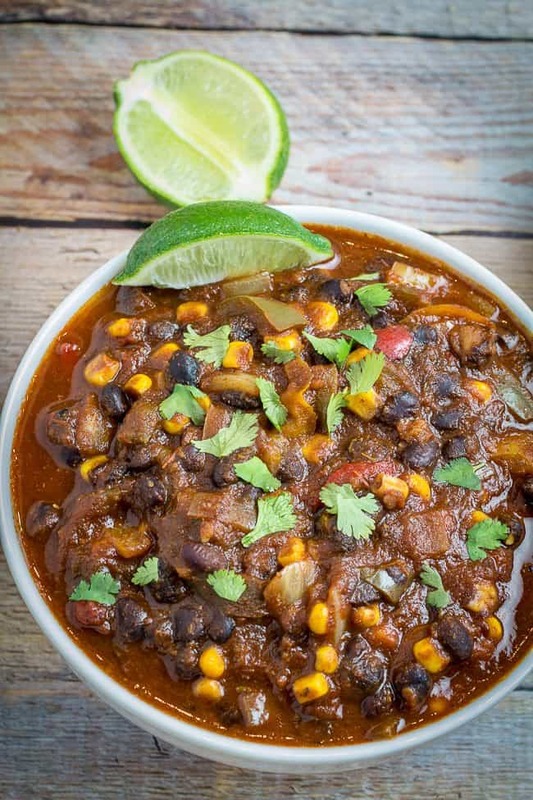 And this Slow Cooker Black Bean Chili was a definite lifesaver during this crazy month. 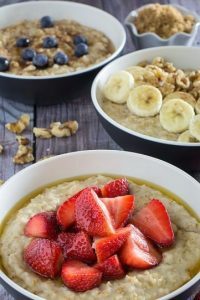 It’s really simple to make, and there’s a good chance you already have these items in your pantry. I hope you love this one as much as my family does! 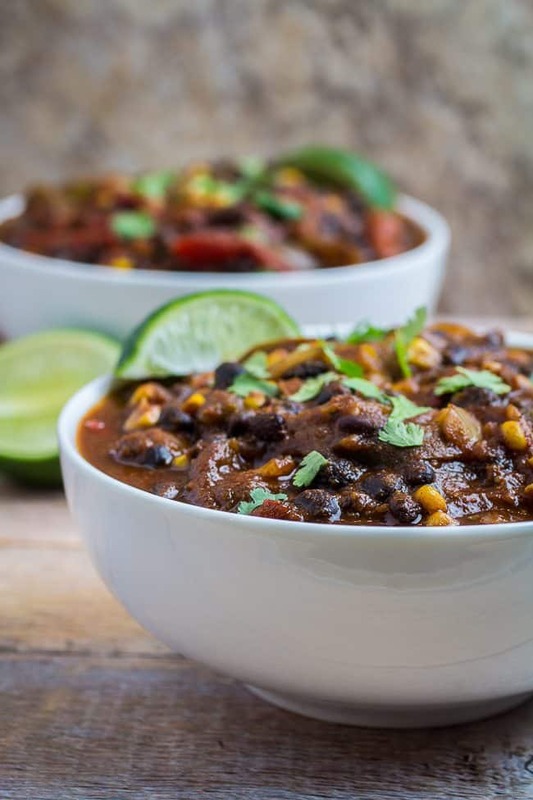 Savory black beans mixed with sliced peppers, corn, crushed tomatoes, and southwestern spices are slow cooked to perfection in this Slow Cooker Black Bean Chili. This is the perfect meal to use up what you already have in your pantry. You won't believe how easy it is to make! 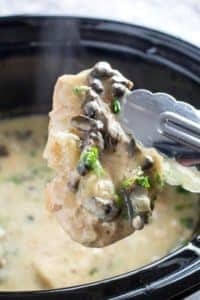 Add all ingredients to slow cooker and stir together. 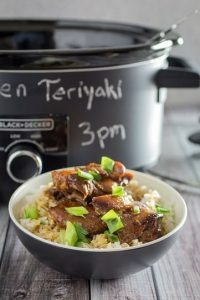 Set slow cooker on HIGH for 4 hours or LOW for 8 hours. Stir once more before serving.